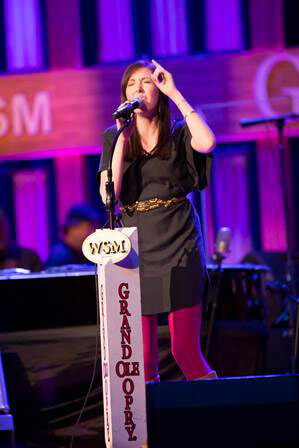 Nashville, TN - (January 7, 2014) - 42nd Annual Dove Awards' "Artist of the Year" and "Female Vocalist of the Year," Francesca Battistelli, graced the historic Grand Ole Opry stage on January 4 for the first time. A career milestone for the vocalist, she sang her Grammy-nominated song "Free To Be Me" and her hit song "This Is the Stuff." Battistelli is slated to release her third studio album, If We're Honest, on April 22. The album features her latest single, "Write Your Story," which was the most added song at Christian radio on January 6. Since her debut in 2008, Francesca Battistelli has earned a Grammy nomination (Best Gospel Performance), six Dove Awards including 2011 "Artist of the Year" and 22 Dove Award nominations. Both her debut album, My Paper Heart (certified gold in 2012), and her 2011 sophomore release, Hundred More Years, took the No. 1 spot on Billboard's Christian Album chart. With over 978,000 in album sales to date and over 1.8 million single downloads, she is the best-selling new artist in the genre in the past decade. Her music has also been featured on TriStar Picture's "Soul Surfer," Columbia Picture's "Julie and Julia," TLC's "Jon & Kate Plus 8," ABC's "Extreme Makeover: Home Edition," NBC's "The Biggest Loser," Fox's "So You Think You Can Dance," and several other television and movie outlets. In addition, this past fall she was featured on over three million Diet Pepsi Cans throughout the U.S. On February 7, she'll join Sanctus Real for the "Hands of God Tour" followed by "The Bible: SON OF GOD Tour 2014" in March/April. For more information and a complete listing of dates please visit: www.francescamusic.com.